Morpeth suffered only their second home defeat of the season as they went down 2-1 to Frickley Athletic on Saturday. 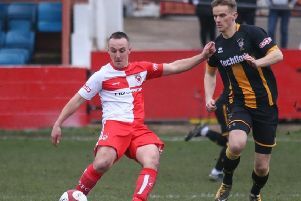 A game marred by petty exchanges was sealed in the 90th minute when Tyler Walton scored. Earlier, Jacob Hazel had put the visitors ahead before Wayne Phillips equalised. The opening stages of the game showed what was to come as minor fouls threatened to escalate into more bad blood between the sides following their meeting earlier in the season which saw 3 red cards. When football did get on top, David Carson was the first player to see sight of goal but his shot was skewed wide with the ball bobbling as he struck it towards goal. The opening stages of the game belonged to the hosts with Wayne Phillips slaloming into the box before seeing his shot blocked. The visitors did respond and it was their captain Jacob Hazel who was a handful throughout the game who fashioned the first opportunity. Dan Lowson was equal to it as he produced a fine pointblank save before making an equally good save to deny Jameel Ible. Sean Taylor, who was instrumental throughout for the hosts forced Hugo Warhurst into another save before a last ditch intervention from Ible put the ball narrowly past his own post as Taylor threatened again. The first chance of the second half fell the way of the visitors and they capitalised on it. Hazel sprung the offside trap and was able to charge clear before keeping his cool to drill it beyond Lowson for the opening goal. Morpeth needed to respond quickly and they did in empathic fashion. Wayne Phillips grabbed the goal but it owed a lot to the perseverance of Liam Henderson who delivered a terrific ball into the box and Phillips ghosted into the box to head home. 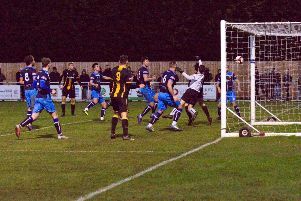 Town continued to press and Warhurst was forced into a save from Taylor’s curling effort. Liam Henderson then tried an overheard kick but it was comfortable for the ‘keeper. The visitors rallied and Michael Turner needed to be alert to pinch the ball off the toe of Hazel as he was poised to strike. As the visitors continued to press, Hazel again saw an effort blocked. The Highwaymen were restricted to long range efforts which all cleared the bar without troubling Warhurst. There was to be one more goal in the game and it proved decisive as the visitors left with all three points. Tom Potter won a corner but the visitors countered through Hazel and with Morpeth forward, he squared the ball for Tyler Walton who gave Lowson no chance. * Morpeth make the long trip to Derbyshire to face Gresley on Saturday.